Powered by iSoftBet, Crystal Clans is a 5 reel, 50 payline slot that has a fantasy/adventure theme. Set in a crystal-filled cave, look out for the W wild symbol as it comes with multipliers of up to 10x when part of a winning combination. Crystal Clans is all about the Free Spins feature where you can begin with up to 50 free spins – if a wild is part of the triggering spin, the multiplier value is applied to all winnings during the feature meaning a 10x multiplier can come into play. With more free spins to be won, you can also win a multiplier up to 10x on the extra free spins. There are potential wins of 4,000 times your stake available on each spin/free spin. Finally, Crystal Clans is exclusively available at LeoVegas Casino. Powered by Just For The Win and Microgaming, Sidewinder is a 5 reel, 243 ways to win slot. With a retro/8-bit feel to it, this innovative game comes with 3 wild symbols. Central to the action is the Sidewinder feature where the respective wild in the top horizontal or bottom horizontal reel will give you 576 (for 1) or 1,125 ways to win (for 2 horizontal reels). There’s also a Free Spins feature where you start with up to 10 free spins – the wild and Sidewinder scatter symbols can appear on both horizontal reels to give you more free spins. If a wild lands on the same position on both horizontal reels, they will connect to give you a fully wild reel – this can lead to 3 wild reels on each free spin and payouts of up to 2,720 times your stake. Powered by Red Tiger Gaming, Piggy Pirates is a 6 reel, 40 payline slot that has a pirate theme. There’s a Piggy Bonus feature where the piggy pirates appear randomly and move across the screen 1 reel at a time. If all 3 appear at once, you’ll enter the Unlimited Free Spins feature. With an infinite number of free spins, every wild symbol is collected – the free spins only stop with the Big Bad Wolf shows up. All collected wilds are then added back onto the reels for 1 last free spin. Piggy Pirates can pay out handsomely with potential wins of 2,000 times your stake. Powered by Blueprint Gaming, Genie Jackpots MegaWays is a 6 reel slot which uses Big Time Gaming’s MegaWays game engine and offers you up to 15,625 ways to win. With an Arabian theme, look out for the Genie randomly appearing in the base game as you’ll benefit from extra wilds, wild reels with a multiplier up to 5x, extra wilds and mystery symbols as well as extra Bonus symbols. Genie Jackpot MegaWays is all about the Genie Free Spins feature where you can start with 20 free spins – you then pick from magic lamps to add a modifier. You can get special ? symbols which transform into the same symbol, locking wilds, genie streaks and an unlimited multiplier which increases with each free spin. You also have the chance to win additional free spins. Lastly, you can buy your way into the Genie Free Spins feature for 100 times your stake and select your modifier! Highly volatile, this is a genie who’s lamp you want to rub. 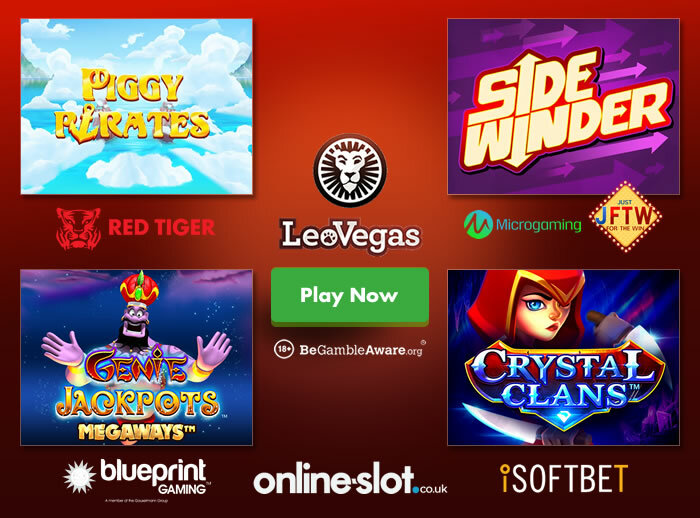 All 4 new slots can be played at LeoVegas Casino – they plenty of new titles like Play ‘N Go’s Street Magic, iSoftBet’s Hot Spin, Novomatic’s Totally Wild and Quickspin’s Big Bot Crew. Sign up to get 20 no deposit spins on Play ‘N Go’s Book of Dead, a 100% first deposit bonus up to £300 plus 30 more Book of Dead spins (once you deposit).